A party is on. A slim woman looks wistfully at a platter of rice but decides to have just a spoonful. Enter a plump woman who asks her to have more; she declines. 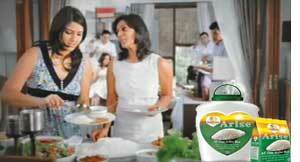 “We know why you cannot eat rice,” hints the television commercial as it shows the plump woman’s back. It then promotes a polished white rice variety that would keep the slim woman “fit and active”. The product is Saffola Arise, launched recently by Marico, owners of the Saffola brand. The print version of the advertisement claims the rice has good carbohydrates. On its website, Marico claims the rice, along with other Saffola products like edible oil, is the “first line of defence against heart diseases”. One such claim is about Arise having 20 per cent less carbohydrates. The claim is based on just one study and a nutrient analysis. “But nutritional claims have to be substantiated with data,” stressed B Sesikeran, Director of the Centre’s National Institute of Nutrition (nin) in Hyderabad. Marico said Arise has been studied in some of India’s premier institutes that confirm it is healthier than other white polished rice. When asked if it would not be simpler to reduce carbohydrates by draining starch water from the cooked rice, company spokesperson Ramya Rajagopalan said, “In-home techniques will not consistently lead to the desired benefits.” “A lot of new-age households might not be aware of such techniques. Saffola Arise caters to such niche consumers, driven by convenience and need for a healthier option,” she said. Nutritionists consider the Moolgiri rice sold under the brand name Arise inferior to unpolished brown rice (also low GI food) since valuable nutrients are lost in the process of polishing. So what is the aggressive promo all about? “It is just an upmarket product for beautiful people,” said Veena Shatrugana who earlier worked with nin. Arise is by no means cheap: a kilo costs Rs 69 as against Rs 25-30 for regular white rice. The product was targeted at Indian consumers after export of non-basmati rice varieties was banned in 2008, said Arun Kumar, senior manager of Tajmahal Agro Industries, promoters of Moolgiri rice grown in south India. Marico procures the rice from Tajmahal. So far, the market for this rice is limited to Rs 2,00,000 as per ACNeilson data of February 2010.